While it's a little late in the season for some most berries, once we arrived at our campsite 2 days ago and set up the tents, we walked around to do some foraging. Well, I walked. The kids biked. We went to the various sites I remembered that had berries with some luck. I found one blueberry, very few partridge berries, lots of bunchberries, no wintergreen, but mostly blackberries. 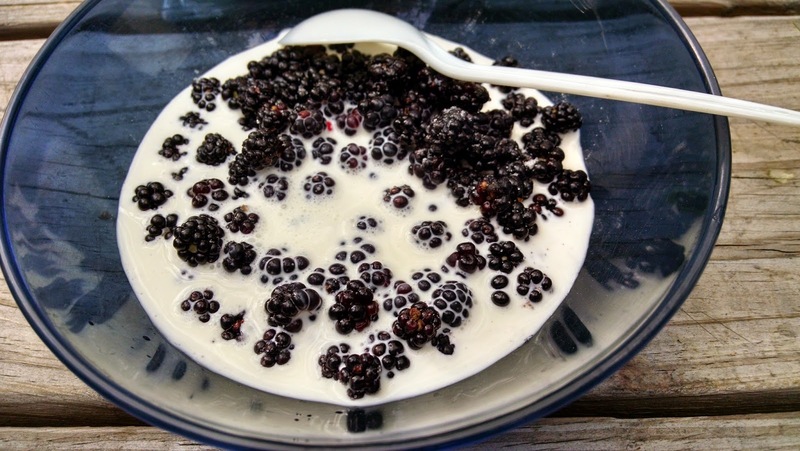 We picked what looked good, got back to the campsite and had a little afternoon snack of foraged berries with sugar and cream.